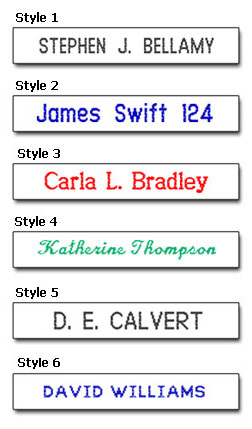 These Woven Name Tapes are ideal for School uniforms. They are available in a range of colours at no extra cost and are usually dispatched within 2 or 3 working days. Choose our Woven Name Tapes if you need your labels delivered quickly – perfect for use in nurseries, schools and care homes. These sew on woven labels are 8mm high and the length will depend on the font style and number of characters. They are woven to the highest standards and are available in six lettering styles and five text colours. Maximum of 30 letters and space. Script (style 4) cannot be embroidered in Upper Case. If you are looking for an Iron on Woven Tape please see Iron on Woven Tapes. These labels come in packs of 36 for £7, 72 for £9 or 144 for £15. Previews are an approximate guide.